'The Light in the Piazza': Partnering on the Road Ever since The Great White Hope left resident theater to Broadway and won the Pulitzer Prize, not-for-profit theaters are developing productions hoping for commercial success. 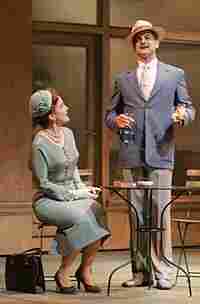 Kelli O'Hara, left, and Matthew Morrison in a scene from the Lincoln Center Theater's production of The Light in the Piazza. Ever since The Great White Hope transferred from a resident theater to Broadway and won the Pulitzer Prize, not-for-profit theaters have been developing work with an eye to a potential commercial afterlife. Jeff Lunden charts the saga of the new musical The Light in the Piazza, which started on the West Coast and is headed East for an opening on Broadway at the non-profit Lincoln Center Theater this April. In an environment where Broadway musicals are either theme-park attractions or splashy adaptations of Hollywood movies, where do writers who want to tell delicate, emotionally complex stories go? In the case of The Light in the Piazza, Adam Guettel and his collaborator, playwright Craig Lucas, chose to develop their show in regional theaters. The musical first hit the stage at Seattle's Intiman Theater, and after some major revisions was staged again at the Goodman Theatre in Chicago. By the time the musical came to the Lincoln Center Theater, it had a $3.5-million budget and a full orchestra. While all the theaters involved in the creation of The Light in the Piazza would love it to be a commercial success -- and share in the financial benefits -- that's not why they invested in the show, says Roche Schulfer, executive director of the Goodman Theatre. "This process of The Light in the Piazza is kind of a calling card for what is possible," he says.